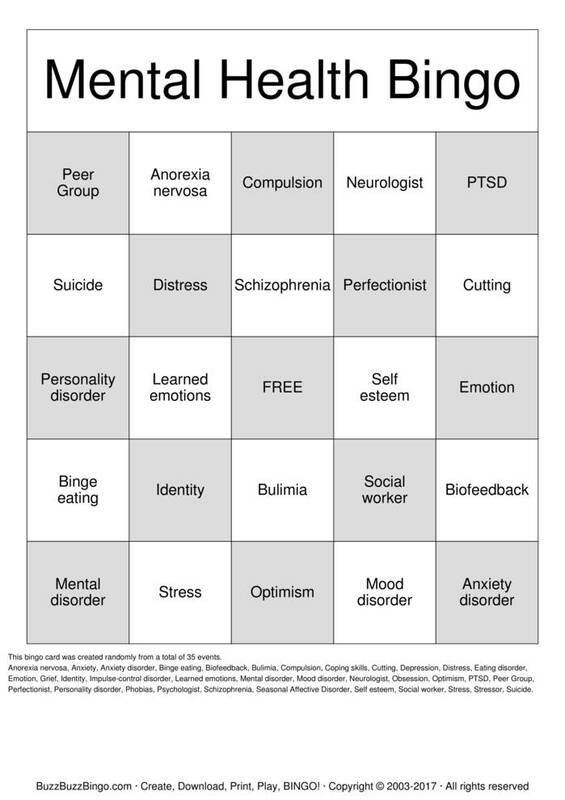 Print 2 pages of Mental Health Bingo Cards for free. Download a PDF with 2 free pages of bingo cards plus instructions and a randomized call sheet. Play Mental Health bingo in a browser or customize the events, free space, etc. Purchase more randomly generated bingo card pages below. Anorexia nervosa, Anxiety, Anxiety disorder, Binge eating, Biofeedback, Bulimia, Compulsion, Coping skills, Cutting, Depression, Distress, Eating disorder, Emotion, Grief, Identity, Impulse-control disorder, Learned emotions, Mental disorder, Mood disorder, Neurologist, Obsession, Optimism, PTSD, Peer Group, Perfectionist, Personality disorder, Phobias, Psychologist, Schizophrenia, Seasonal Affective Disorder, Self esteem, Social worker, Stress, Stressor, Suicide.